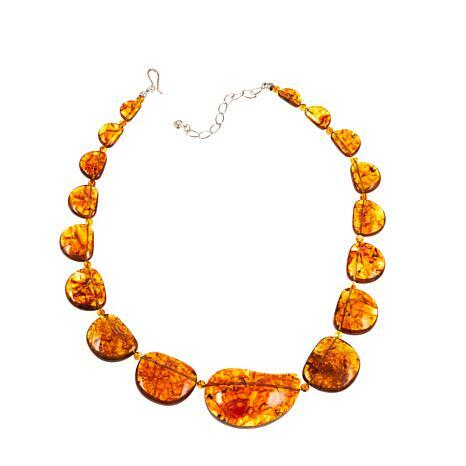 Ancient amber takes center stage in this unique necklace from Jay King. 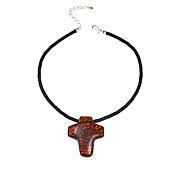 It features pressed amber harvested from a swampy area in Ukraine. There, local villagers use a series of pumps and fishing nets to gather it for sale. The result? 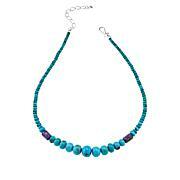 A necklace that's as beautiful as it is unique—just like the woman who wears it! 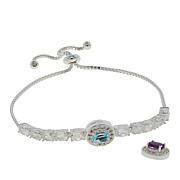 I love this beautiful necklace! Each one is unique, so I get to wear a one of a piece. It has a big presence, but is so comfortable to wear because amber is so lightweight. Ive had many compliments whenever I wear it. Thanks Jay for another beauty! 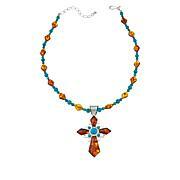 Beautiful necklace; feels smooth as silk to the touch and cool to the skin; best amber I have seen in years. Large enough pieces to have a presence. I love love love this necklace! The only thing that I would change would be the color of the cord that runs through it. If they could use another color so it doesn't look so obvious when it is threaded through the Amber it would be great! Otherwise, I can't say enough good things about it. I'm glad I put my name on the waitlist and waited for it to finally come back in. I love amber. The history it's existed through, I just find amazing. Talk millions of years with any stone and I am interested! I love the glimpse into the past pieces like this one offer. Thank you.